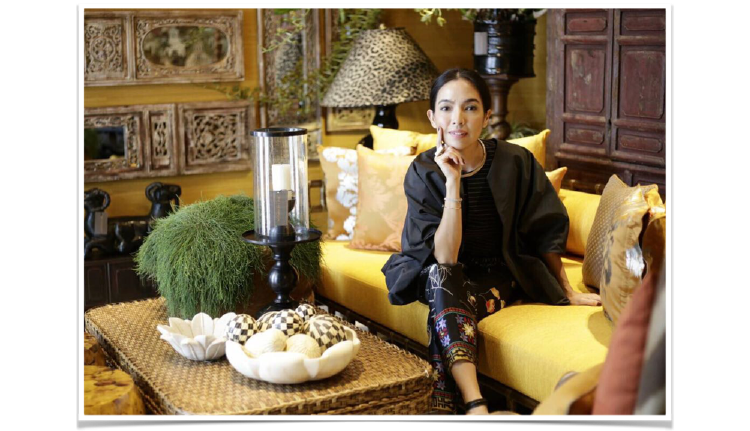 Dao is a renowned Bangkok-based interior designer, the co-founder of her own company, and the visionary behind the recent renovation of Jim Thompson’s Bangkok Home Furnishings showroom. On top of all this she is also an adoring mother of two. We spoke to Dao to find out what inspires her and why she chose to work with Jim Thompson. Dao originally studied Interior Architecture at Rhode Island School of Design, Rhode Island, USA. Following her education, she worked as an interior designer for Woodman Design Group in Boston Massachusetts, and then Brennan Beer Gorman Monk in New York. In 2001 she decided to return to her native Thailand and took up the esteemed position of Design Director for The Premier Group’s luxury resorts; Rayavadee (in Krabi), Tamarind Village (Chiang Mai), and a recently-acquired hotel, tentatively named Raya Heritage (also in Chiang Mai). Dao is also the co-founder of Quattro Design, a furniture showroom where clients can purchase beautiful curated, one-of-a-kind furniture pieces and home accessories, handpicked from leading manufacturers around the globe, or specially made in-house. I established Quattro Design with three friends nearly a decade ago, opening a space in Bangkok to stock finely crafted furnishings. Last year, our company revealed a new, expansive Quattro Design show space in Phuket. How would you describe your work/design philosophy? I think I have very eclectic taste in design. I love mixing; i’m in love with the elements of nature, rich textures, vibrant colours and mixing contemporary and vintage, something old with something new. I want to create a story and give life to a space. I like my designs to be unpredictable. What inspires your interior decoration choices? My inspiration is everywhere, especially when I travel and get to visit the workspaces of artisans and craftsmen around the world. There is no better inspiration for design than travel and exposure to different cultures and environments. Curating the Jim Thompson rooms at the showroom came naturally for me. I love patterns, vibrant hues and rich textures and Jim Thompson has it all, sophisticated colour, strong silhouettes.. I love that I can juxtapose pieces from different eras in history, or genres of style. I used a lot of antiques or one-of-a-kind pieces for this project, reupholstering them using different techniques, as well as curating many customized pieces to maximize the versatility of JT fabrics. In this project, I combined not only the old and the new, but elements of the formal and the casual in new ways that feel right for today. See more pictures of Dao’s work on the Jim Thompson showroom, Bangkok in our previous post. Aside from Dao’s work on the renovation, Jim Thompson have also collaborated with Quattro Design on multiple occasions, using their up-market designs for our biannual photoshoots and brochures.